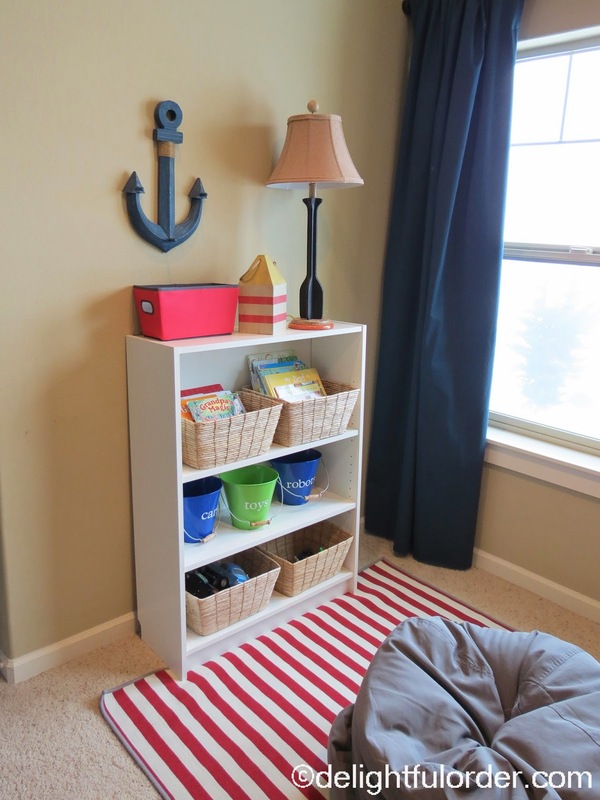 Today I'm showing you my youngest boys shared Nautical room. It's a work in progress room. I really haven't finished it yet, but I'm going to show it to you anyway. 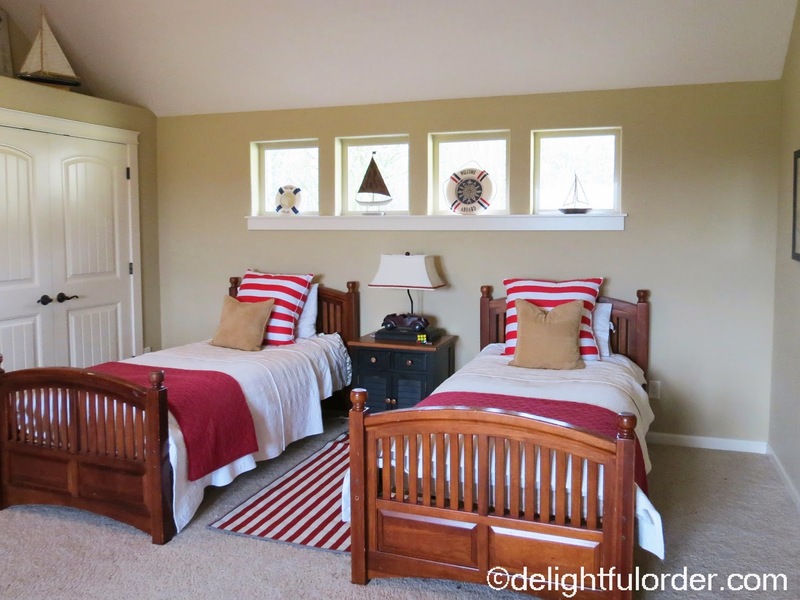 Someday I'd like to change the red and white striped shams to blue chevron stripe or blue trellis design shams. I'd like those gold pillows to be red with a large white letter momogram on each. I'd also like to get two trunk type toy boxes to go at the foot of each bed. Wouldn't that be so cute? Some of you may think I'm crazy to have cream bedding coverlets in a boys room, but I will tell you this... you can bleach whites/creams and I have many times. We've had the cream bedding for many, many years and I will say, they still look fine and are in pretty good condition. 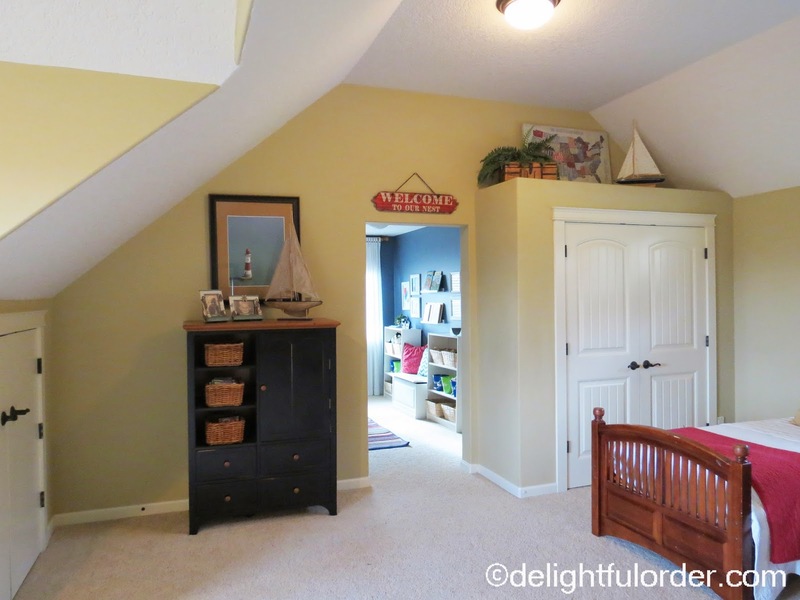 I'd still love to paint the room someday too and I think I'll paint the ceiling too (or at least part of it) as there is just too much ceiling in here with the slant. 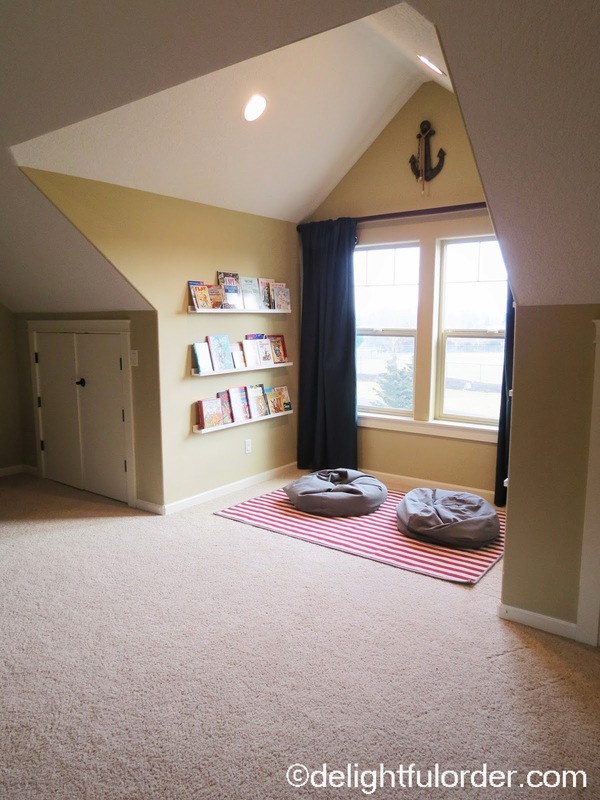 This room is actually more of a big bonus room, but I have to use it as a bedroom as we don't have enough bedrooms not to. 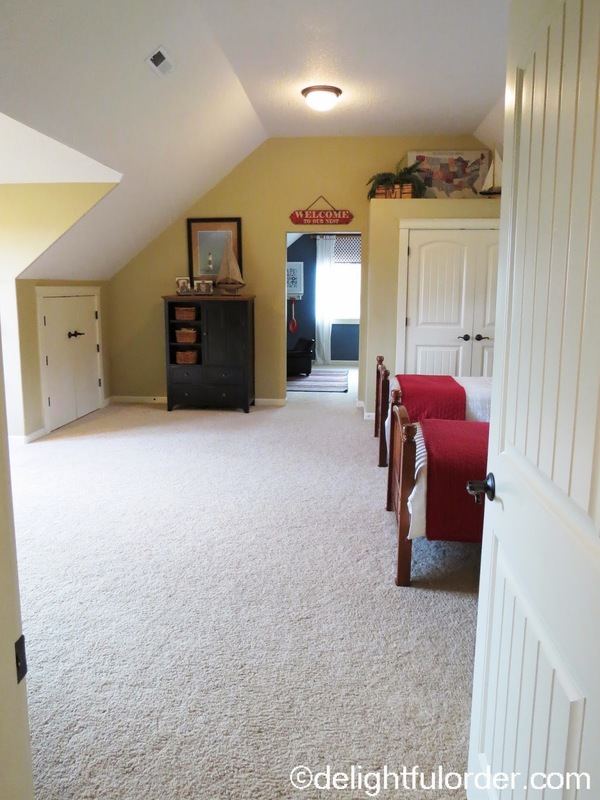 The "old" toy room is through that walkway. I showed you the toy room tour the other week (which isn't the toy room anymore.) That room is now my second oldest sons room. I'm still waiting on a door for his room too. The lighthouse poster is from Costco. I still need to add a matte to that piece. 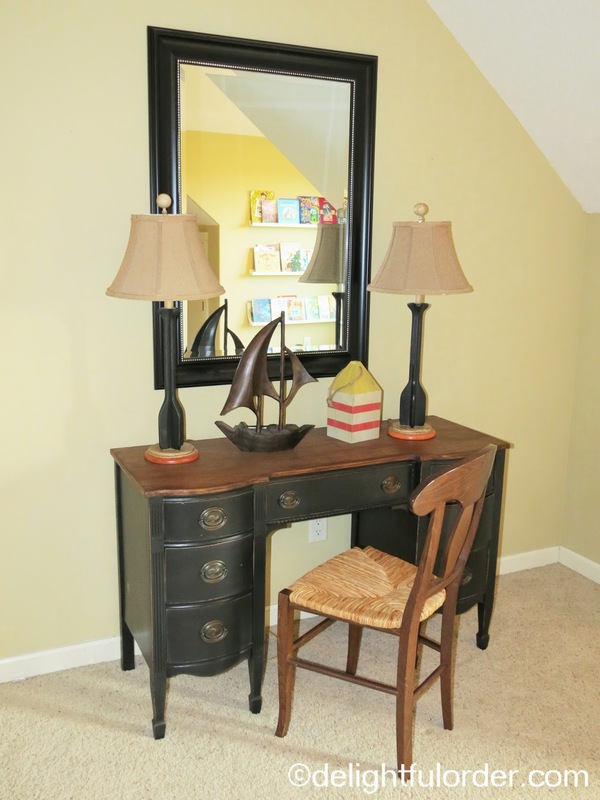 ...across from the beds, I had created a reading nook. (Which doesn't even look like this anymore) Now I've moved all the toys to this section of the room. .. oh and those curtains... they're pinned up there. That's another "project" that I need to finish. All I need to do is sew a pocket for the rod to go through, but I have yet to do it. (Believe me I have lots and lots of this kind of thing going on in my house - curtains that are pinned up and yet to be sewn.) If only my mom lived closer! She's great on the sewing machine, me not so much. 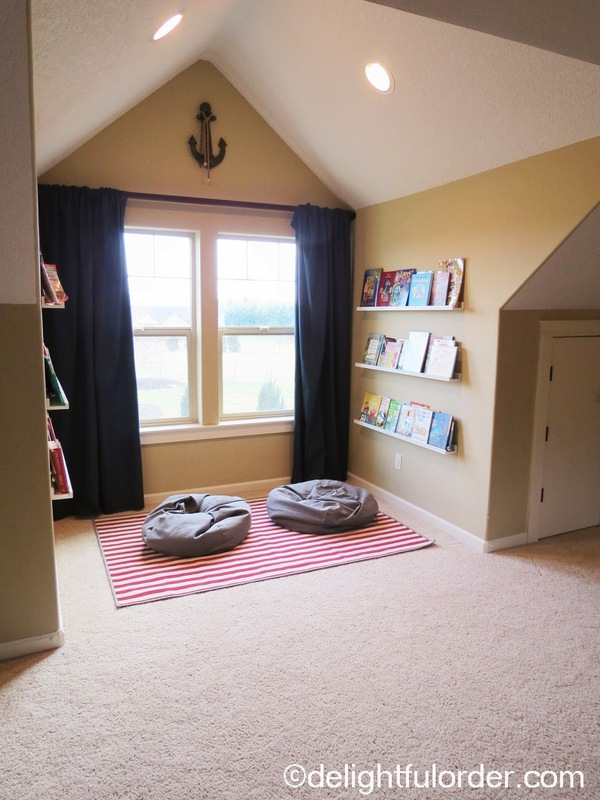 The bean bags are from Target, the rug and curtains are from Ikea. 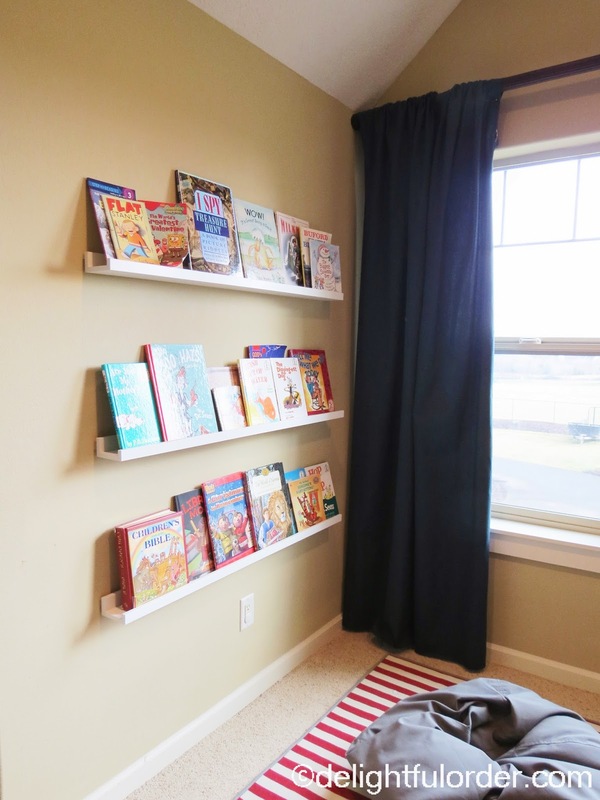 and these picture ledges are the RIBBA picture ledges from Ikea. I just used them for books instead and I do love them! The link directs you to the smaller ones, but I have the bigger ones here. 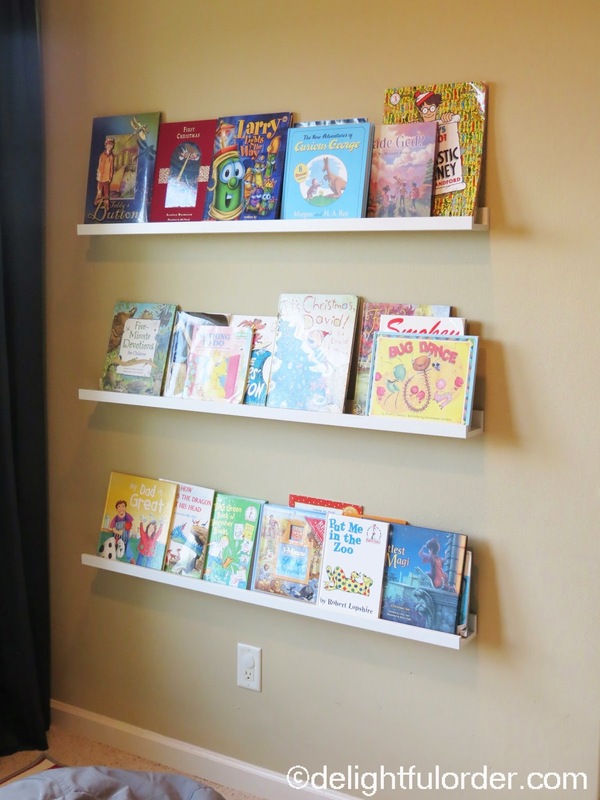 I moved the bookcases that shelves the toys into this area. and it's been working great. 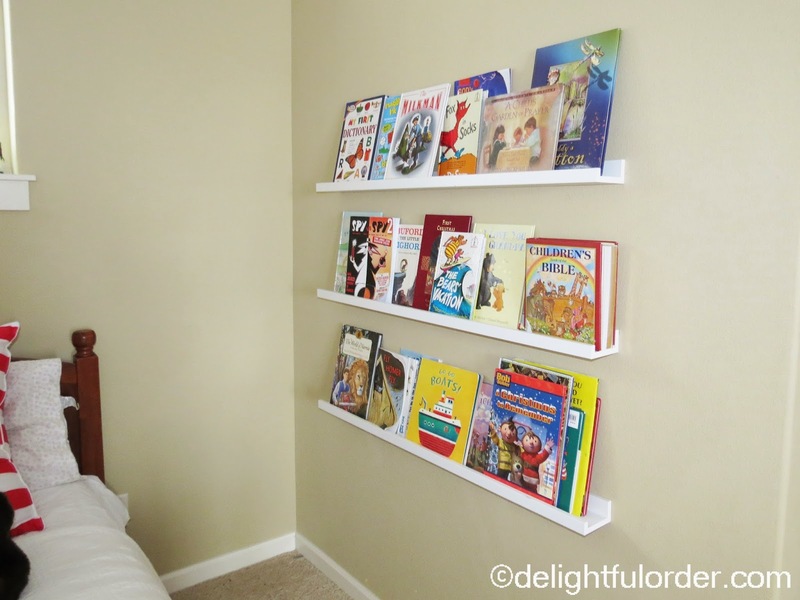 ... and I did LOVE those ledges with the books, so I moved three of them on a wall next to the beds. and that is the tour of my boys' shared bedroom. I love this room! 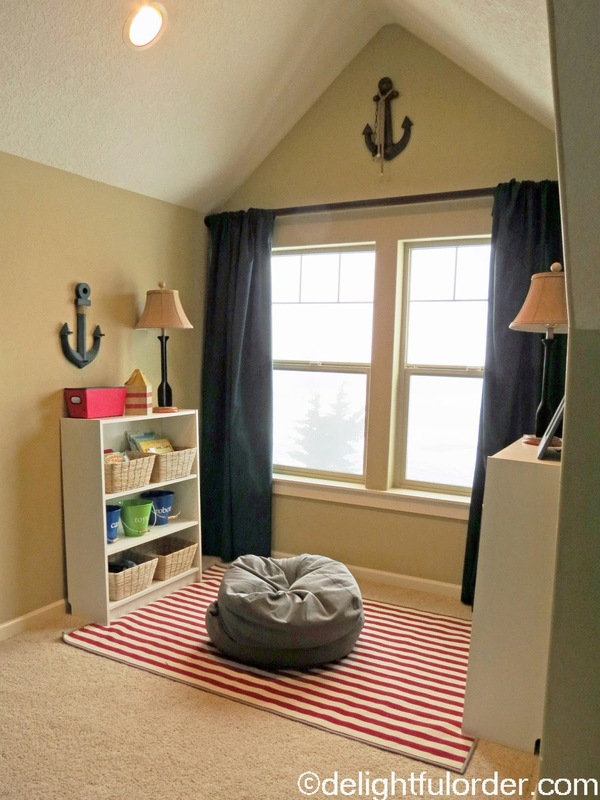 I also have a Nautical bedroom for my little boy. I think it is timeless 'theme' and so flexible. Yours is beautiful! 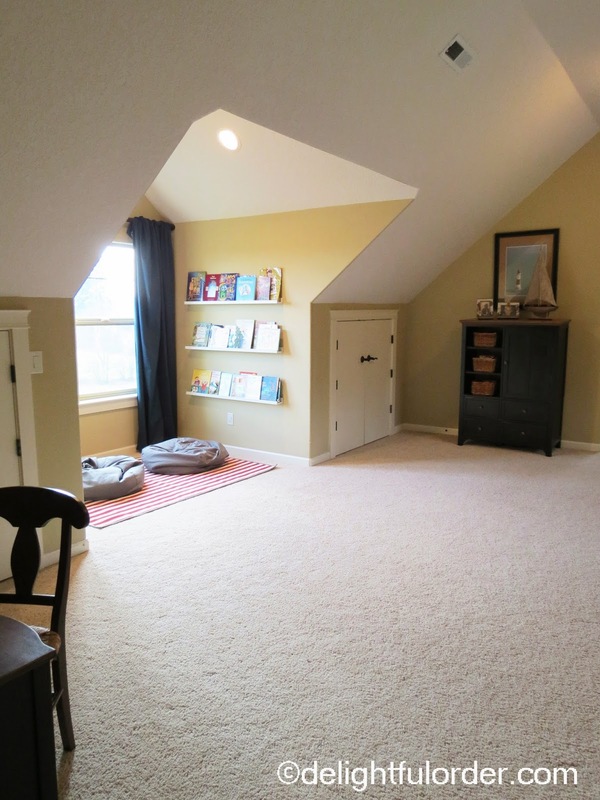 What a great space! It looks like there is a lot of room for the boys to play as well. Congrats on #5 arriving soon! I can not wait to see more! Oh my gosh that is so stinkin' cute! It looks like a model home. 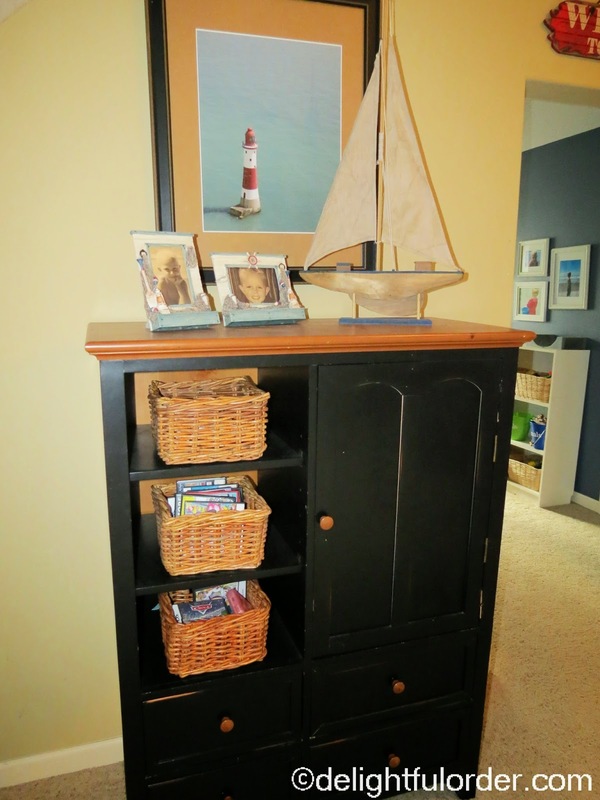 I have been struggling to get my kids stuff in order and failing miserably in the process. It's always cluttered and crazy. wow, how organized and assembled, great job -you have motivated to clean up my kids rooms!! I love it!! 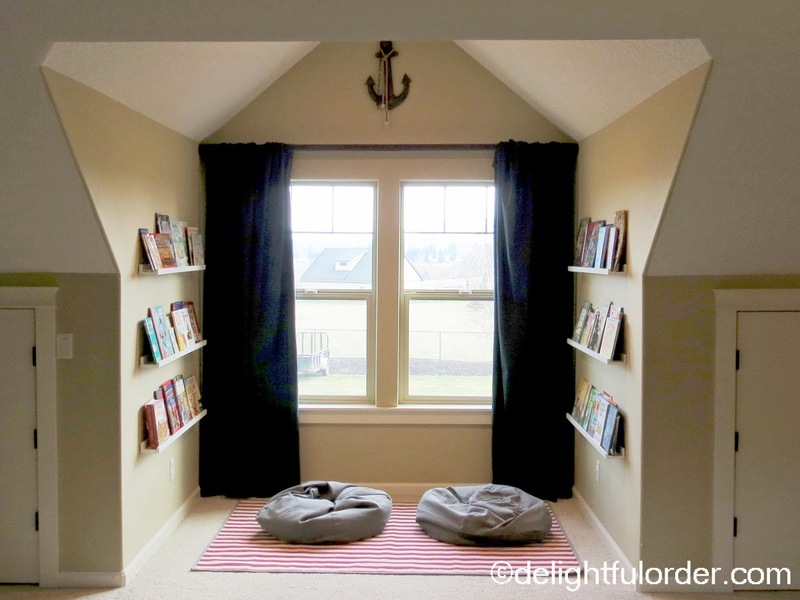 The reading nook is awesome!! Looks great! What a wonderful room! 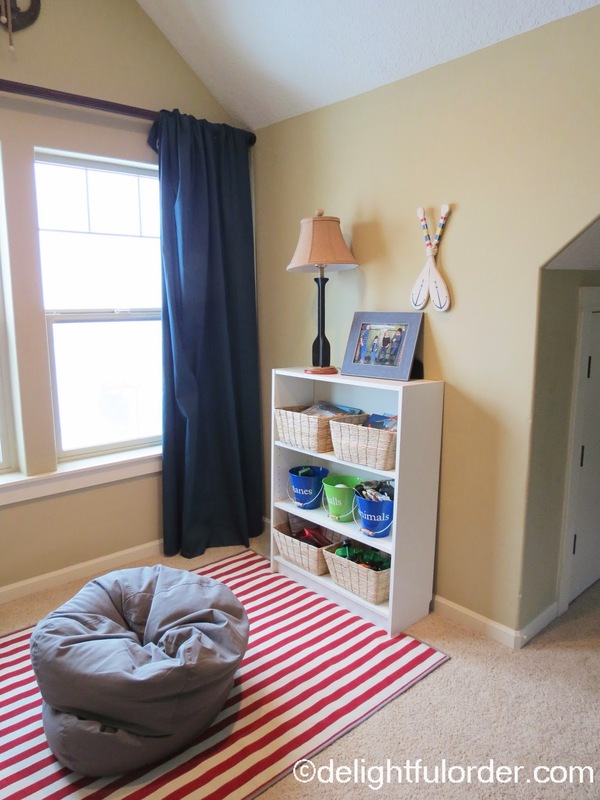 I just finished my baby nautical nursery if you want to check it out! 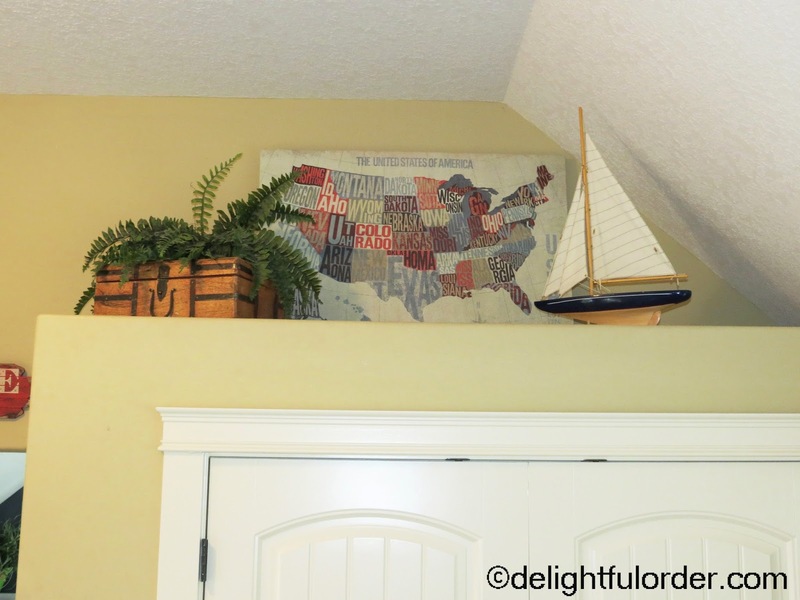 http://thewhitmers.blogspot.com/2014/02/nautical-boy-nursery.html I'd love to know where you got your sailboats- I've seen some at Hobby Lobby but they're not too cheap for the big ones! I have found some of the sail boats at TJMaxx, others from Homegoods and others I got from friends. Very cute ideas! Praying things go well with #5! We have 5 kiddos too! 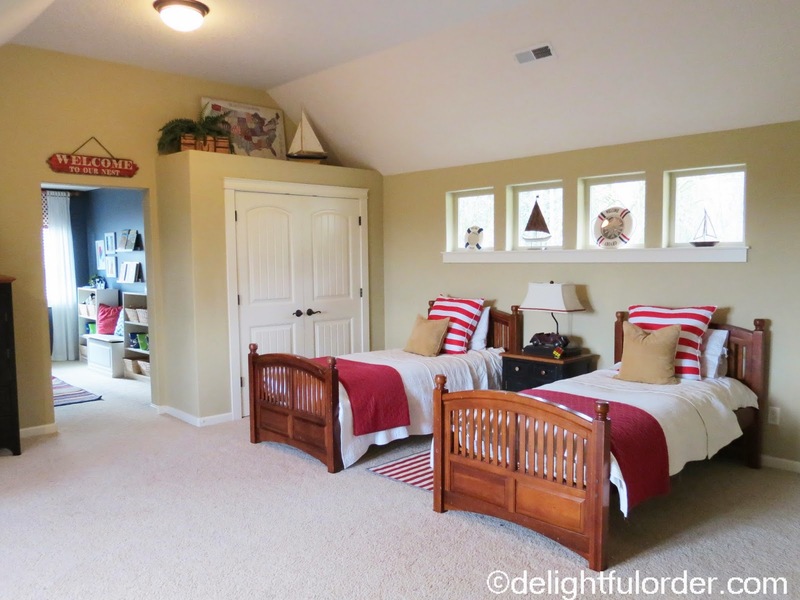 I am in love with this room! All of the details are perfect. Is bright and cheerful without being over the top. Great job!